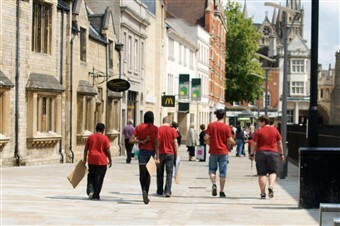 Giving out umbrellas to wet shoppers, writing thank you notes to shop staff and staging a red carpet were just some of the ways Christian teenagers have been sharing God’s love with the people of Peterborough. The young people got alongside other people of their age, invited them to events and chatted about God. Over eighty teenagers became street invaders between 2 -6 August, as part of a week-long outreach event. Being part of Street Invasion inspired young people to engage and help the people of the city and demonstrate the love of Jesus through their words and actions. Chris Duffett, President of the Baptist Union worked with the c ity centre outreach team and got participants thinking about how they could reach out to passers-by in new and creative ways. The eye-catching activities, including giving out fruit labelled with the fruits of the spirit and inviting people to walk down a red carpet, provided opportunities for people to hear how special and loved they are and to receive prayer if they wished. The team also did prayer treasure hunting which helped them hear what God wanted to say to specific people and wrote appreciation cards to local shop staff teams. There were six ‘zones’, in various areas of the city, which held their own event where young people could come to hang out, i ncluding alcohol-free cocktails, cafes, or games and sports. In the afternoons delegates would flier the zone areas to invite people and get stuck in with practical serving such as painting, gardening and litter picking. 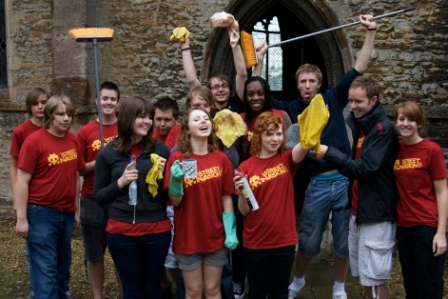 These social action projects were in conjunction with local churches. Street Invasion mornings gave options of workshops that prepared, equipped and enabled the young people to go out inspired. These included topics such as Gospel presentation, illustrations of the Gospel, visual images, giving a testimony, Multimedia, Prayer, arts and other creative evangelism. Matt Wild, Director of Christian Options in Peterborough Schools (CROPS), talked about the young people taking part in Street Invasion: “We are blown away by their enthusiasm and so many are moving out of their comfort zones. We spend time preparing them and making sure they are equipped and inspired. In the mornings they have plenty of time to talk in their teams about what they want to see God do and also how they want to be changed themselves. The week led up to the last night which saw nearly 300 young people turn up to an LZ7 gig which included a Gospel presentation. Sixty five teenagers responded to the message that was shared and became Christians.